This inviting three-bedroom apartment spread over two floors is perfect for a family of four. It comes with a large, fully equipped kitchen that will make home cooks happy, a four-person dining table, a private balcony, air conditioning, hardwood floors, a walk-in closet and a comfy living room with a TV. The master bedroom also has a TV. In fact, the entire décor is reminiscent of a Bali retreat thanks to South Asian accents and tropical plants that add an exotic flair. The apartment is in a quiet and well-maintained concrete and red brick condo building that was built in 2005. The four-storey building, located amid mature trees, comes complete with an elevator, private parking and its own green space. 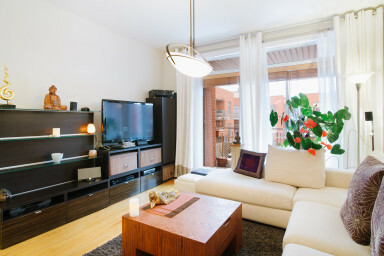 One of the best aspects of this apartment is that it’s steps away from beautiful Laurier Park, where you can go skating in the winter or cool off in the outdoor pool in the summer. Nearby Laurier Village, a charming corner of the trendy Plateau neighbourhood, is home to all manner of restaurants, cafés, gourmet shops and independent boutiques. Check out Brûlerie St-Denis for freshly roasted coffee, Le Fromentier for some of the best bread in town, and Atelier-Boutique Gaïa for handmade ceramics and pottery classes. Conveniently connected to downtown, Laurier subway station is a 12-minute scenic walk through the park away.